During World War II, bandleader Artie Shaw toured the South Pacific with a Navy band. Glenn Miller died when his airplane disappeared over the English Channel. At one point during the war, more than 60 jazz bandleaders were serving in America’s armed forces. Swing bands were disbanded when their members enlisted or were drafted. Yet the music played on, thanks to more than 100 “all-girl” bands who toured the country, playing for dances and crowds hungry for a good time. One of the most famous bands was the International Sweethearts of Rhythm, the first integrated women’s swing band in the world and the subject of a new book by poet Marilyn Nelson. Musicians walk a tightrope. Below them lie madness and beauty. The world was aflame, the men soldiering at the front. The Sweethearts had no philosophy. They just did their duty. A girl has to trumpet down Jericho, if a man can’t. Nelson will read from “Sweethearts” at the Loft this Friday at 7 p.m. She will be accompanied by area jazz artists Donald Washington on saxophone/clarinet and Faye Washington on flute. Formerly of Detroit, the Washingtons are educators as well as musicians and parents of drummer Kevin Washington. Nelson served as the judge for this year’s McKnight Artist Fellowships for Writers, Loft Awards in Poetry/Spoken Word Poetry. The winners she selected, Kirsten Dierking, Susan Carol Hauser, Michael Larson and Elisabeth Workman, will be introduced and acknowledged. A reception following the reading will give audience members a chance to meet and greet the poets. Nelson is the author or translator of 12 books of poetry including three National Book Award finalists and three Coretta Scott King Honor Books. She is the former poet laureate of Connecticut (2001-06), founder and director of Soul Mountain Retreat, a writers’ colony, and a professor emeritus at the University of Connecticut. She also has Minnesota connections. She earned her Ph.D. from the University of Minnesota and taught for a time at St. Olaf College in Northfield. Earlier this week, Nelson was a guest on KFAI’s “Rhythm and Grooves” hosted by Larry Englund (who happens to be a Sweethearts fan). Listen here (it’s the 5/4/2010 show). Here’s a video of the Sweethearts themselves performing four songs. Their biggest hit, “Jump Children,” starts at the 2:45 mark. 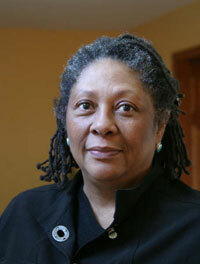 Marilyn Nelson reads from “Sweethearts of Rhythm,” Friday, May 7, 7 p.m., The Loft Literary Center, Suite 200, Open Book, 1011 Washington Ave. S., Minneapolis ($5; free to Loft members).